At Waterloo Heights Dental, our primary goal is to prevent the need for restorative dentistry in the first place by providing comprehensive preventive care that creates a healthy environment in the mouth. However, we’re all human, we’re not perfect, and things happen. Our teeth tend to become worn down as we age, and many of us are more prone to tooth decay and gum disease than others. Sometimes our teeth can be damaged or broken from eating something hard or a traumatic injury. Whatever the case, rest assured we can restore your smile with the most durable, natural looking materials that look, feel and function just like natural teeth so you can get back to your natural self. Where many dental offices still use traditional x-rays and the magic of sight to detect cavities, Waterloo Heights Dental uses laser cavity detection technology. This advanced laser technology allows us to illuminate small areas of decay before they would be visible otherwise, so we can treat them before they get bigger and compromise more of your healthy tooth structure. Today we use a safe, durable, and natural looking tooth colored resin to fill cavities, rather than the unsightly and potentially toxic metal fillings of the past. We also use air abrasion technology to gently and conservatively remove the decay while leaving your healthy tooth structure intact. Tooth colored fillings are strong enough to withstand temperature changes without expanding and contracting like metal fillings. They are completely safe for the human body without the use of toxic mercury. And they are perfectly color matched to blend in seamlessly with your natural teeth so we can fill it and you can forget about it. If you have an area of damage or decay that’s too large to fill with a simple filling but not large enough to warrant a full crown, an inlay or onlay may be the perfect solution. 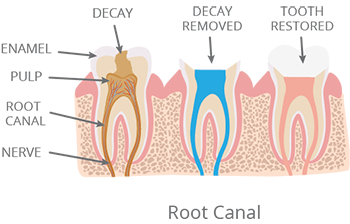 Inlays repair damage and fill large cavities contained within the cusp or the outer ridges of a tooth, while onlays are typically larger and repair damage that extends beyond the cusp. We use air abrasion technology to remove areas of decay while keeping your healthy tooth structure intact for the most conservative approach to your new restoration. Our 3D imaging technology makes goopy, uncomfortable impressions a thing of the past. With 3D imaging, we can take quick and easy digital impressions to ensure your inlay or onlay fits perfect the first time. If you have a tooth that’s been decayed or damaged and is past the point of repair with a filling, inlay or onlay, you may need a crown to protect your remaining tooth structure and bring the tooth back to full health, function, and aesthetics. A crown is a tooth shaped cap that’s placed over your damaged tooth after it’s been prepared and any decay has been removed. A new crown from Dr. Shih will allow you to enjoy eating comfortably again, to speak naturally, and to smile with confidence in a complete, natural looking set of teeth. If you’ve ever had any type of dental work in the past, you may remember sitting with putty in your mouth to have your impressions taken. That’s not fun for anyone. That’s why we’ve invested in advanced 3D imaging technology that allows us to take quick and easy digital impressions – without the mouth full of goop. Digital impressions leave less room for human error so we can make sure your crown fits perfectly the first time. If you’re missing a tooth or multiple teeth, you understand the consequences it can have on your sense of confidence and quality of life. It can be hard to enjoy eating, to speak naturally, and to smile with confidence. Not to mention the consequences on your oral health. Surrounding teeth begin to shift and rotate which can compromise your alignment and bite. The underlying jawbone starts to deteriorate without the support of the tooth or teeth. A bridge from Dr. Shih at Waterloo Heights Dental can bring your mouth back into a healthy balance. If you’re missing teeth, we will always recommend dental implants, as implants are the only way to replace the tooth root and preserve the jawbone. 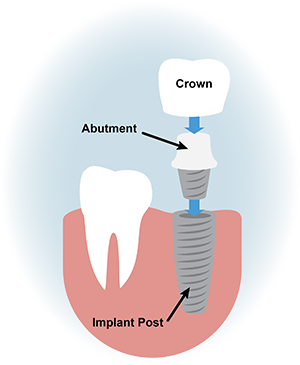 We can replace a single tooth with an implant and a crown, or multiple teeth with implants and a fixed bridge. However, if you are not a candidate for dental implants (if you’ve lost a significant amount of bone caused by missing teeth), or you can’t afford implants, a bridge is your next best option. 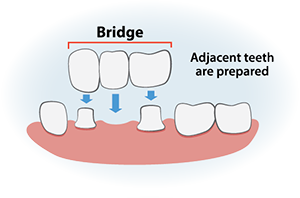 A traditional bridge consists of one or more replacement teeth, anchored with the help of crowns on either side. We use advanced 3D imaging technology to take digital impressions that are quick and painless, and a far cry from the goopy impressions of the past. Digital technology leaves less room for human error so we can create your perfect bridge that looks, feels and functions just like natural teeth. If you’re missing most or all of your natural teeth or living with old, ill-fitting dentures that rock and slip, we would love to help you get your bite back with our modern denture options. Today’s dentures at Waterloo Heights are a far cry from those of dentures past. We use advanced 3D imaging technology to take digital impressions that are quick, easy and painless. Digital impressions are then converted by our cutting edge dental lab into beautiful new teeth crafted just for you from a combination of acrylic and ceramic to look, feel and function just like your natural teeth. When it comes to missing teeth, we will always recommend dental implants as implants are the only way to replace the tooth root, which is an essential component a healthy mouth and jawbone. Dr. Shih can refer you to a trusted implant specialist in West Salem to have your implants placed. Once healed, we can secure a minimally invasive denture that’s locked in place so you can eat, speak, and smile to your heart’s content. Implant supported dentures are the best option for patients missing all their teeth and can be maintained just like you would your natural ones, so you can get back to living your life with a smile. If you still have some healthy teeth remaining, we want to preserve those for as long as possible. We can use your existing teeth to anchor a partial denture to restore function, balance, and aesthetics to your smile. 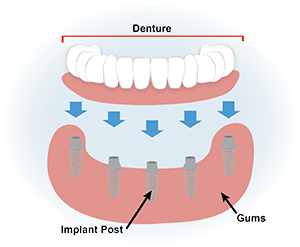 Partials are securely locked in place and can be anchored further with the help of dental implants. If you are not a candidate for implants, our traditional dentures are still a wonderful option to help you regain your healthy smile. Many of our denture patients find they fit so well, they don’t even need adhesives to lock them in place. Dental implants are the #1 recommended tooth replacement solution today – by doctors and patients alike. That’s because implants are the only way to replace the root of a missing tooth, rather than just replacing the crown or the visible part of the tooth. Without the tooth root, the underlying jawbone will begin to deteriorate or atrophy. Implants are made from biocompatible materials like ceramic and titanium so they actually become fused with the jawbone, stimulating new bone and tissue growth around the implant and offering a secure anchor for replacement teeth like crowns, bridges or dentures. If you’re missing teeth, Dr. Shih would love to sit down with you and discuss your options to see if you’re a good candidate for dental implants. If so, she will refer you to a trusted implant specialist in West Salem for surgical placement. Implants typically require a healing period of a few months while they fuse with the jawbone to ensure optimum integration. Once healed, Dr. Shih can fit you with a beautiful, fully secured crown, bridge or implant supported dentures for the most life-like solution to missing teeth. If you’re experiencing a toothache, you may have an infection within the tooth that should be treated with a root canal. Infections can reach the inner chamber of the tooth when tooth decay is left untreated and goes deeper and deeper into the pulp. If you need a root canal, rest assured, today they are a fairly routine and painless procedure. They’re usually no more uncomfortable than having a cavity filled. If your oral health has been devastated by a traumatic injury or illness, you may have lost all hope in ever having a healthy, functional smile again. Dr. Shih and our team at Waterloo Heights want you to know there is hope for you and your smile, and you will be in great hands in the care of our highly skilled and compassionate team. There’s no need to feel ashamed or embarrassed, we see dental health problems all the time and if anyone understands and wants to help, it’s us! Using our advanced digital technology and modern materials, we can completely rebuild your smile from the ground up. First, we will want to perform a complete bacterial screening to assess the environment in your mouth. If necessary, we will perform oral disinfection to get any gum disease or tooth decay under control to ensure the work we do will last for as long as possible – and to help minimize your risk for other systemic diseases like heart attack, diabetes, and stroke. Dr. Shih will sit down with you in a comprehensive consultation to come up with an ideal treatment plan that works for you. If you are in need of dental implants or any type of oral surgery, Dr. Shih will refer you to a trusted specialist in her network that can provide the best care possible. Then we will begin to discuss your options for replacing teeth including beautiful and life-like crowns, bridges or dentures. Dr. Shih has helped many patients to be able to enjoy eating, speaking, and living life confidently with a smile again, when they had lost all hope. If poor oral health is bringing down your quality of life, we would love to help you feel like yourself again. If you’re ready to experience the difference of a dentist that genuinely cares about your overall health and well-being, you’ve come to the right place. Contact your West Salem dentist, Dr. Priscilla Shih at Waterloo Heights Dental today.